Chat on the patio in comfort with the Griffith 3 Piece Metal Outdoor Conversation Seating Set by Crosley. This pretty set includes two Chairs in White with Side Table in White and it is delightful in vintage style. 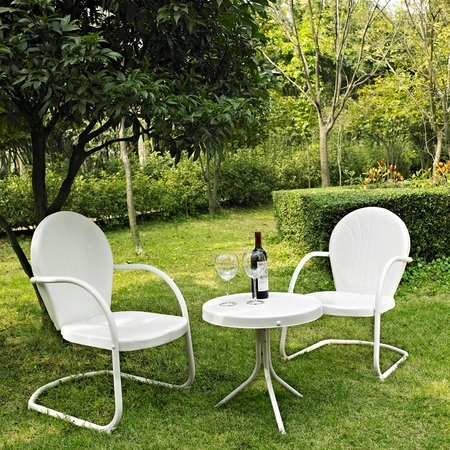 Outdoor furniture in this style was very popular for three decades. Sit back and relax in the contoured seats with favorite beverage on the side table and enjoy. Each Crosley unit is made of steel with powder-coated finish. Resists rain, snow, sleet and sun.